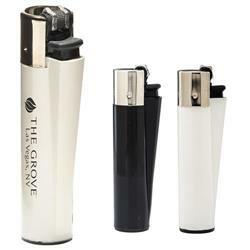 Clipper Custom Lighters with your logo. 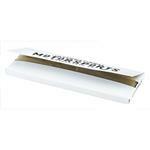 The Clipper brand has product features that set it apart and made it the best selling lighter in many European countries. It has excellent safety features including a fixed flame height, nylon body, round shape and a child resistant mechanism. It uses the highest quality isobutane fuel, not cheap smelly butane. It is refillable and the flint can be replaced, so it is friendlier for the environment than disposables. The flint arm is detachable, so it can be used as a convenient packing tool. Order in increments of 48. Each box of 480 has a federal hazmat fee of $55 for shipping as required. This promotional lighter brand is trending. Dimensions: 3" x 7/8" x 5/8"
Typical Imprint Area(s): 1 3/4" x 1/4"
$55 per carton of 480 hazmat shipping fee.